Berry refuses McDowell's request for domestic employment at the schools in order to learn about and apply the schools educational practices with African American students. Berry describes the philosophy of work well done and tells McDowell that close observation would reveal nothing else. 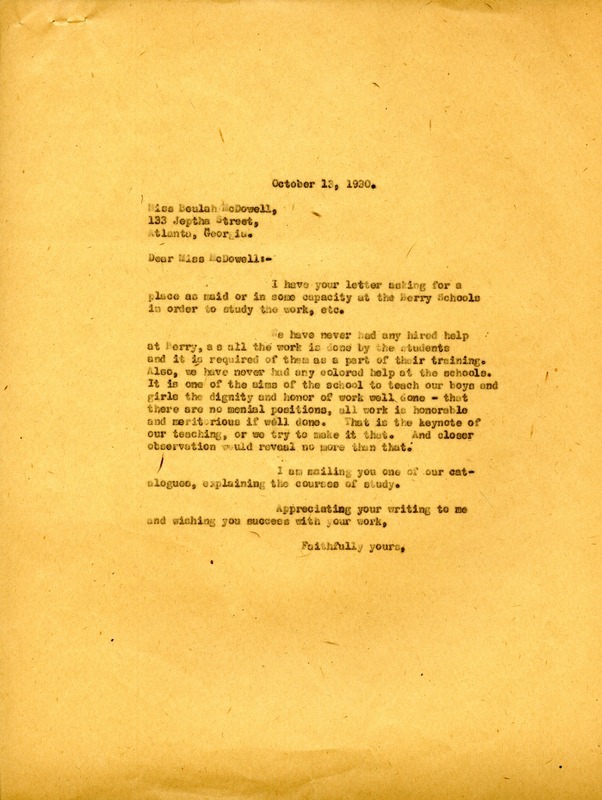 Martha Berry, “Letter from Martha Berry to Beulah McDowell.” Martha Berry Digital Archive. Eds. Schlitz, Stephanie A., Jordan Brannen, Sherre Harrington, Chelsea Risley, Meg Ratliff, et al. Mount Berry: Berry College, 2013. accessed April 25, 2019, https://mbda.berry.edu/items/show/13144.